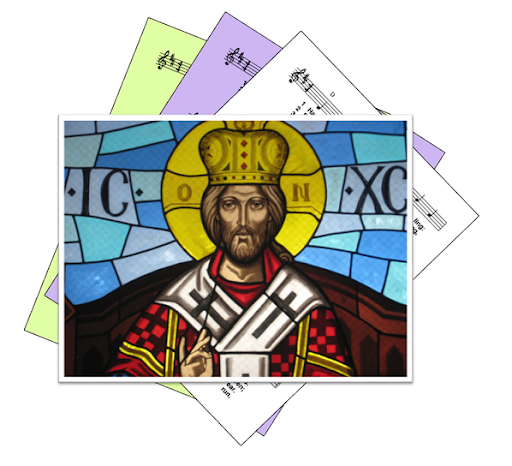 A selection of hymns and songs, based on themes from the Roman Catholic lectionary for the Feast of Our Lord Jesus Christ, Universal King (Christ the King), Year C.
A small selection of hymns that are still copyright be included if they are particularly appropriate. First: Samuel - David is anointed king of Israel, in the presence of the Lord. Psalm 121 : I rejoiced when I heard them say "Let us go to God's house" / Jerusalem is built as a city / For Israel's law it is. Second: Colossians : Thanks to the Father who made it possible for us to join the saints and inherit the light ... he has created a place for us in Christ's kingdom. ... Christ is .. the image of the unseen God, in him all things were created. Gospel: Luke - The events when Jesus in hanging on the cross, and the people and soldiers mocked him "If you are the king of the Jews, save yourself". One of the criminals hanged defended him and asked "Jesus remember me, when you come into your kingdom". God's kingdom. Jesus Christ who brings out of darkness into the light of his kingdom.